The 2010 ice melt season on the Greenland ice sheet (see video) set new records, according to Marco Tedesco, director of the Cryospheric Processes Laboratory at the City University of New York. The melt season was “exceptional”, Tedesco said. Melting in some areas lasted as much as 50 days longer than average, starting very early at the end of April and ending later than usual in mid-September. During the summer, temperatures over large parts of Greenland were as much as 3ºC above average, snowfall was below average, and the capital, Nuuk, had its warmest spring and summer since records began in 1873. Analyses of remote sensing data, surface observations and output from a regional atmosphere model point to new records in 2010 for surface melt and albedo, runoff, the number of days when bare ice is exposed and surface mass balance of the Greenland ice sheet, especially over its west and southwest regions. Early melt onset in spring, triggered by above-normal near-surface air temperatures, contributed to accelerate snowpack metamorphism and premature bare ice exposure, rapidly reducing the surface albedo. Warm conditions persisted through summer, with the positive albedo feedback mechanism being a major contributor to large negative surface mass balance anomalies. Summer snowfall was below average. This helped to maintain low albedo through the 2010 melting season, which also lasted longer than usual. Jason Box will be posting more on the extraordinary warmth of last summer in Greenland at his meltfactor.org blog soon. […]Let’s take a look at Coral Harbour, located at the northwest corner of Hudson Bay in the province of Nunavut. On a typical mid-January day, the town drops to a low of –34°C (–29.2°F) and reaches a high of just -26°C (–14.8°F). Compare that to what Coral Harbour actually experienced in the first twelve days of January 2011, as reported by Environment Canada […]. After New Year’s Day, the town went 11 days without getting down to its average daily high. On the 6th of the month, the low temperature was –3.7°C (25.3°F). That’s a remarkable 30°C (54°F) above average. On both the 5th and 6th, Coral Harbor inched above the freezing mark. Before this year, temperatures above 0°C (32°F) had never been recorded in the entire three months of January, February, and March. The unseasonal warmth is associated with what Henson describes as ” a vast bubble of high pressure” which formed near Greenland in mid-December. The high was associated with record-breaking 500mb heights, a measure of the “thickness” of the atmosphere and associated with warmth below. This high helped to direct the atmospheric flows that brought Europe’s December cold spell. With the delayed freeze-up in Hudson Bay and a warm winter on the fringes of the Greenland ice sheet, it may that 2010′s record for ice melt will not last long. And that’s not good news. (*)Marco Tedesco, X Fettweis, MR van den Broeke, RSW van de Wal, CJPP Smeets, WJ van de Berg, MC Serreze, and Jason Box, The role of albedo and accumulation in the 2010 melting record in Greenland, Environmental Research Letters DOI: 10.1088/1748-9326/6/1/014005. My thanks to Jason Box for the details. Shucks, if it gets any warmer just imagine how Medieval vineyards the melting will uncover!. Of course the colder than usual weather in Antarctica (remember that about 90% of the earth’s ice is located there!!) and growing ice cover in the southern pole is not mentioned!! Overall, ice cover in Antarctica is growing. 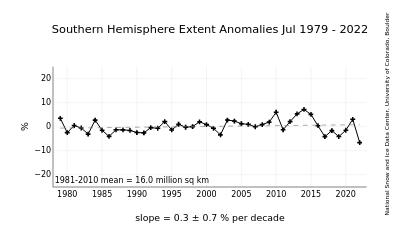 NSIDC report that over the last 30 years Antarctic sea ice extent has been growing at a rate of nearly 5% per decade – can’t say that’s a sign of warming down under. “On both the 5th and 6th, Coral Harbor inched above the freezing mark”…Lets pop the bubbly, we are sure having a heatwave up there. Maybe there will soon be reef coral in the harbor again! Lank you avoid once more to appreciate the whole picture. While temperatures in the inner parts of Antarctica have not been rising, on its fringes and especially on the Antarctic peninsula temperatures have risen much faster than the global average and entire ice shelves have collapsed speeding the flow of glaciers to the sea. The ocean temperatures around Antarctica have also risen and the abundance of krill which forms the basis of much of the oceanic seal life food chain has dropped dramatically – by about 80% – since the 1970ies, which is a huge concern! The rise in temperatures of air surrounding Antarctica has led to a rise in moisture content and hence also to a rise in snow fall on Antarctica which has increased ice thickness, while the sea ice extent has been falling. Do not feed. Red button. ‘neither read, nor feed’ – with pleasure! Sceptic Lank confuses Antarctic sea ice with the ice cap and shelf! Record ice melt is occurring over Antarctic peninsula, and recent satellite imagery confirms net melt elsewhere. Sceptic Lank is a moron – a la Dilbert and his boss’s membership of “Morons of the month”, perhaps one could instigate a “Stupid Troll of the month” contest. This can be fun. Choose your option. Choose your gas. Choose your monitoring station. Just watch out for the most recent entries. They are sometimes adjusted for initial errors. The most important point Tedesco et al make is…”Warm conditions persisted through summer, with the positive albedo feedback mechanism being a major contributor to large negative surface mass balance anomalies. “. The issue is this winter the setup is once again similar to date, low snowpack and warm temperatures, which are an ideal setup for an early exosure of the bare ice, which has the lower albedo. This was an issue noted on Petermann Glacier where snowcover was lost early in 2010. I was following the temperatures there during the snowy weather here in the UK, to counter the argumentum ex fenestra that “global warming is dead, look through the window”, and was staggered by some of the highs in Nuuk, and also in Canada where 20C above the usual mean was recorded. At times Nuuk was warmer than San Francisco, especially at night. I had to go back through almost a month of mean daily temps to see Nuuk fall below 0C when it’s usually around -10C. So, no surprise at all, really. These persistent Arctic highs seem to be getting moire and more common. Recalling that one was responsible for the big sea ice melt of early summer 2007, one wonders if the ice in its present state could survive a summer-long one. Gareth, I’m struck by the interesting coincidence of this paper, Flanner et al. and Hansen & Sato all coming out in the space of a few days. Not to vounteer you for extra work or anything, but joint consideration of them seems worthwhile. Just in case you missed it (I haven’t seen the paper itself), Flanner is quoted in the press release as saying that they found the TOA radiative forcing difference to be +15% over the 30-year period. That seems like rather a lot. .
On a related topic, the land sink isn’t what it used to be. This seems important, but I would have missed it completely if the principal author’s hometown newspaper hadn’t done a story on it. Pop this Science Daily Earth & Climate RSS feed into a reader — delivered the methane paper a while back. Re Flanner et al., I see that Skeptical Science has been busy. MarkR calculates a 20% increase in sensitivity, which we can only hope turns out to be too high.